Ideally suited to a Study area, Lounge, Even fitting in to a modern bedroom area. Allowing easy positioning of the light. The light is finished off with a neat,well proportioned Opal Glass Shade. Lovely, stylish, designer white Muno desk lamp, white. Hardly used. Can be shipped for a fee. Please message me. It not only looks great, but also features an adjustable arm and head, so you can position your light exactly where you want it. Approx size: H 51 x W 15.5 x D 37.5cm. Cable length: 165cm. Assembly: No. Modernising a classic colonial design, the Wooden Tripod Table Lamp will illuminate any living area, hallway, or bedroom in industrial chic fashion. Rustic tripod table lamp. Grey-washed wood design. Hi I am selling Lloytron Flexi Desk Lamp In Silver colour. It is brand new in box . Features: - Metal and Plastic construction - Versatile flexible neck - On/Off switch on base - Bulb: 35w (Bulb Not included) - Height 28 cms See other items for sale. Thanks for watching. Metal and plastic construction Versatile flexible neck On/Off switch on base Bulb: Max. 40W E14 Golf Ball (Not included) Height: 28cm approx. Product Code: 8055715. Halogen Flexible desk lamp. 1000 hours. On/Off switch on base. Bulb: Max. 35W E14 Golf Ball (Not included) Approximate Height: 28cm. Versatile flexible neck. 28W Bulb Adjustable Reading Desk Lamp Task Table Light Jet Black Includes Bulb. In good condition, however has a slight scratch on the lamp, please see pictures. Height: 38cm Delivery: Free same day dispatch with Hermes Tracked postage. If you have any questions, please don't hesitate to ask. This contemporary lamp is a highly versatile item, works great as a desk lamp, dining room light, bedside or reading lamp. Suitable for E 27, 60-watt bulbs. A bulb is not included. Industrial accent piece for your interior! (808 SCOTCH WHISKY Bottle Lamp with purple shade. Empty 808 SCOTCH WHISKY bottle turned into lamp. Bulb included and is easily changed! Bottle is empty SORRY ;-). This item does not contain any alcohol again SORRY ;-). Taken in out of the box and put it back. Light bulb included. 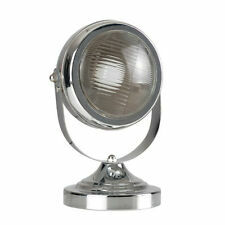 City Scene Touch Lamp - Silver. Bulb type: Dimmable candle bulbs only. Contemporary and stylish. Modern touch base function. Colour: Silver. Illuminate cityscape design. This horn-shaped Ara table lamp is designed by Philippe Starck for Flos in 1988. This classic Starck design incorporates bold sweeping lines that give it a highly distinctive sculptural presence. This lamp is in very good condition, it is cleaned and checked, so full working and ready for use. With a glass base that's complete with distinguished blue colouring, which is darker at the bottom and lighter at the top, it's totally on trend. 150cm cable length. 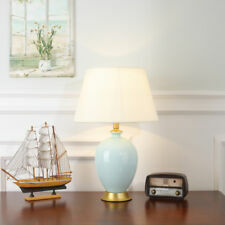 Approx lamp size: H 50.5 x Dia 30cm. L958BK Features: -One light desk lamp.-Versatile flexible neck.-Integral on/off switch. Color/Finish: -Black finish. Specifications: -Accommodates 1 x 35W E14 glass or reflector bulb (not included). Luxurious design - table lamp / night light lamp Eglo Havana. Elegant table lamp. Modern design. Height: 63cm. With G9 socket. Goods from pattern room. 1 x GU10 50W halogen reflector lamp spotlights GZ GU 10 reflector lamp 50W 230VEUR 1,00. Touch table lamp with a round satin nickel base and a cylindrical, polycotton shade. Light Source 40W E14 Candle. Lighting Type Desk Lights. Requires max. 40W, golf ball lamp with E14 fitting (not supplied). It not only looks contemporary and on trend, it also features an adjustable head so you can position your light exactly where you want it. Approx size: H 36 x L 14 x W 17cm. Cable length: 170cm. Colour: Grey. 150cm cable length. Size: H40.5 x W25cm approx. Assembly: No. Size: 40.5 x 25cm. Bulb: Max. 40W E14 Golf Ball (Not included). Versatile flexible neck. Height: 28cm approx. A work space or desk is not complete without a personal lamp. The Hobby Desk Lamp is the perfect lighting solution; highly adjustable and very aesthetic, it will make working at your desk easy. This highly adjustable and very aesthetic lamp will make working at your desk easy. Polished Brass Finish with hand blown green glass shade In-Line on/off switch Height 37cm approx Bulb Max. 60W E27 GLS (not included) .